People are trying to ban a popular weed killer in Martin County. Before Tuesday's county commission meeting, a group of people staged a rally, hoping to encourage commissioners to consider a ban on Roundup and other weed killers that have glyphosate in it. Not only does the group allege that glyphosate causes cancer, but there is also research that it feeds the growth of algae. "We have poison, and we have toxicity, and we have cancer causing things in our water," said one concerned resident. "If there's people on one side that think we should ban everything, I disagree, and if there are people on the other side feel that we should ban nothing, that is not my position either," said Martin County Commission Chairman Ed Ciampi. A Martin County representative says the county doesn't spend more than $135,000 a year on all fertilizer, herbicide and pesticides. Since the beginning of the fiscal year (Oct. 1, 2017) Martin County has spent approximately $1,600 on Roundup. An organizer of Tuesday's rally said it was around $2.4 million. No vote was taken Tuesday morning. The group says glyphosate contributes to the growth of algae. So to help prevent the further development of algae, they're asking for all-out ban. Roundup has come under fire recently. A jury recently ordered Bayer, the maker of Roundup, to pay $289 million in damages to a California schools groundskeeper, who developed cancer from using the chemical routinely. The consumption of glyphosate is also being debated as the chemical was found in some breakfast foods like cereals, granola, snack bars and whole oats. Glyphosate is one of the most commonly used pesticides. It is sprayed on areas both before and after planting to kills weeds. It is also used pre-harvest for weed control and to speed up the process of drying out the grains. KUSA reports in 2015, the World Health Organization’s (WHO) International Agency for Research on Cancer said that glyphosate was a “probable carcinogen” based on the links to Non-Hodgkin Lymphoma, animal studies and potential damage caused to cells in the laboratory. Then in 2016 the WHO and the United Nations released a second report looking mostly at the ingestion of glyphosate in animals. There was a link to Non-Hodgkin Lymphoma, but the levels were very high. As a result, they determined glyphosate did not appear to be a carcinogen. The European Food Safety Administration and the U.S. Environmental Protection Agency all have come out saying glyphosate is not a carcinogen. The California Office of Environmental Health Hazard Assessment, however, did list it as a carcinogen as of 2017. The EPA is currently re-examining their thoughts on glyphosate. 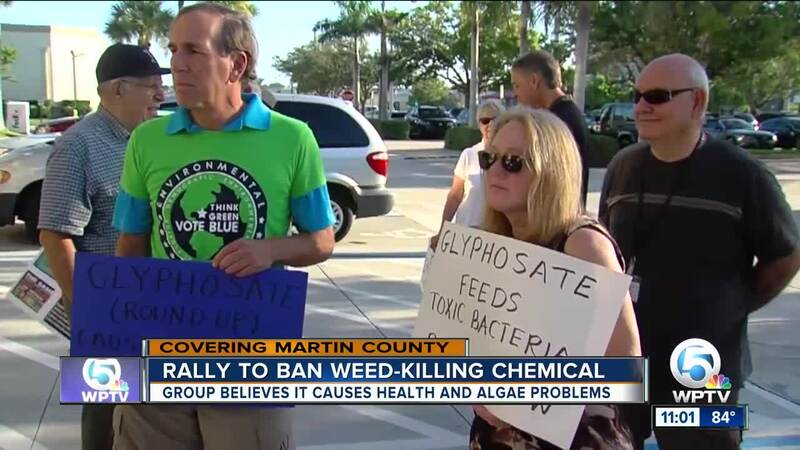 The rally against glyphosate and Roundup is at 8 a.m. at the Martin County Administration Building located at 2401 SE Monterey Road in Stuart.